Considering that the hype machine had built expectations for TDKR to a fever pitch, what I most admire about the whole endeavor is how much Warner Bros. managed to keep so many of the plot twists the movie depends on secret until the very end. 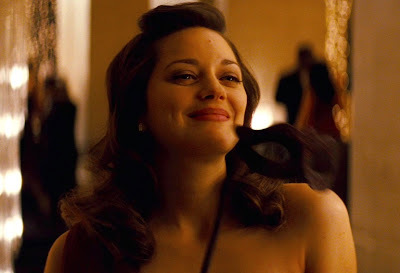 Yes, rumors had been circulating since the sequel's conception that Marion Cotillard would play Talia, daughter of Ra's al Ghul (Liam Neeson), both the Batman's mentor and his greatest villain. 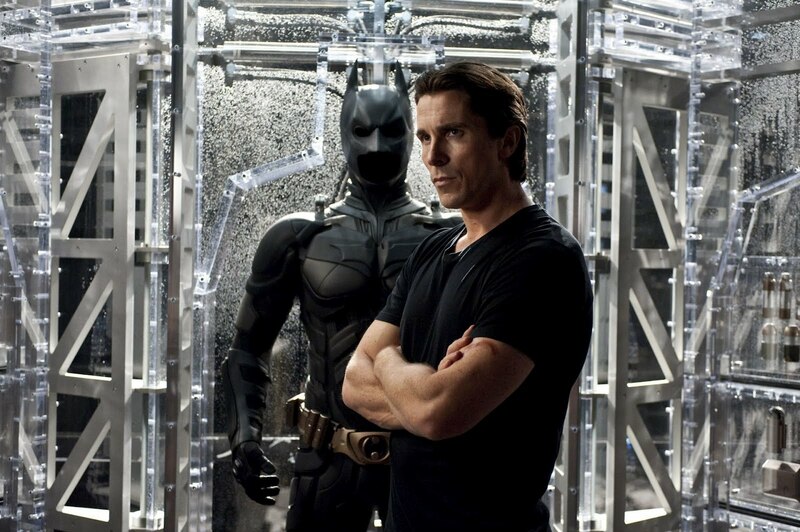 It was also known that Neeson would make a cameo of sorts, even though his character had presumably died at the end of Batman Begins, the first movie in the series. But still, those rumors were just that, the kind of unsubstantiated talk that circulates around a blockbuster of this magnitude. That secretive director Christopher Nolan (Inception) managed to keep how the two Al Ghul's fit into TDKR's labyrinthine plot, despite all of the attendant press scrutiny, is nothing short of miraculous. The grand scale of the production is also awe-striking. Much of TDKR is shot on IMAX, which most would agree is a better use of one's budget than the 3D gimmick liberally applied to most releases now. Nolan has been at the vanguard of IMAX filmmaking, and it's nice that he uses TDKR as a platform for doubling down on the technology. The crisp resolution IMAX offers, without the need of any cumbersome glasses, makes a film much more vivid than the often hit-or-miss 3D, which depends so much on projectionists (often unqualified teenagers) getting the proper brightness of the display/projection correct. In keeping with the kind of epic meant for IMAX, TDKR treats us to countless shots of Gotham's skyline, its city streets overrun by casts of thousands. TDKR is the kind of epic one used to see in 70mm Roadshows in the 60s (with the lengthy, nearly 3-hour running time to match). It's enough to give a viewer pause for long enough to marvel at the kind of ego necessary to marshall the sizable cast and crew successfully in order to precisely execute the kind of story being told here. Because somehow, Nolan manages to present this grand production in such a thrilling way, yet still ties up all of the thematic loose ends left over from Batman Begins and The Dark Knight with no messy unfinished plotlines left over. But, and this is a big but, bigger is not necessarily better. And while TDKR is still a fantastic film worth watching, even more than once, I still think it's the least of the three movies in the series. The sprawling size of it creates a certain emotional detachment. One spends more time impressed with the film's execution than involved in it. From Lucius Fox (Morgan Freeman) and the rest of the Wayne Foundation's Board of Directors held hostage by the hulking Bane (Tom Hardy) and his Fight Club-like band of anarchists to Commissioner Gordon (Gary Oldman) and rookie detective John Blake (Joseph Gordon-Levitt) leading a covert group of resistance fighters in an occupied Gotham city to a broken Bruce Wayne (Christian Bale) holed up in some Middle Eastern prison—the way TDKR jumps from character to character, location to location, plotline to plotline seems almost like someone is coldly crossing things off of some checklist rather than truly unspooling a story with emotional underpinnings. This is not to say TDKR is bad, just more calculated. 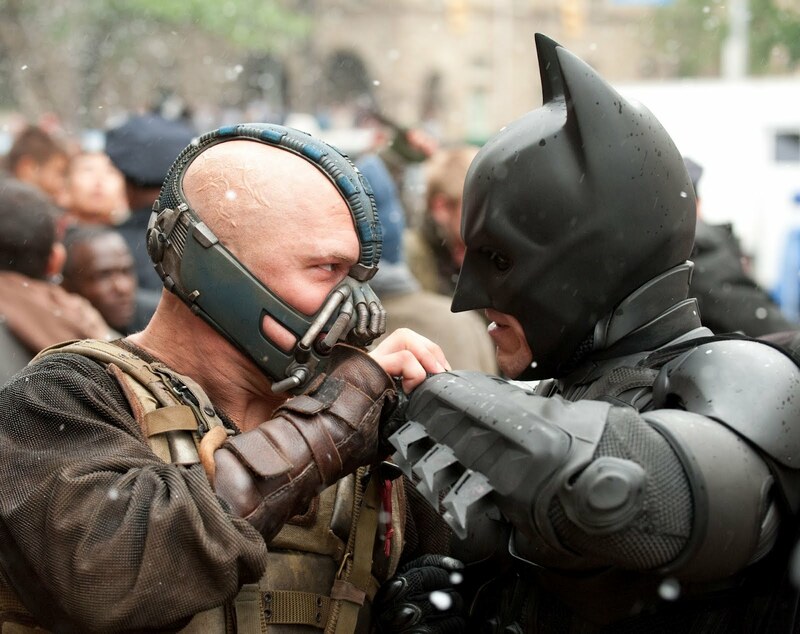 There is much to like about The Dark Knight Rises. One welcome byproduct of this epic sprawl is that Gotham City, a visual pastiche of real-life locations like Chicago, New York, and Pittsburgh, has a vitality unprecedented for fictional comic book (and maybe even cinematic) cities. It is the central character of the film in many ways. 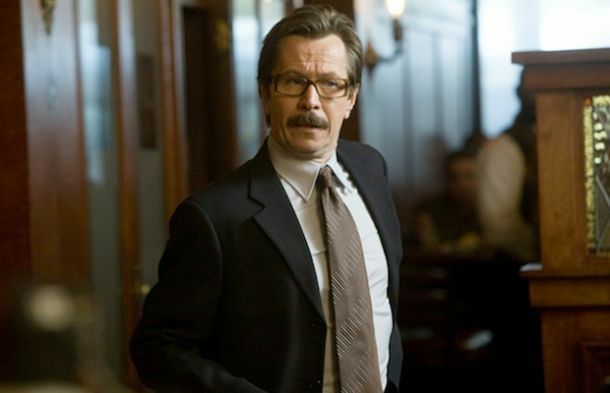 That has the unfortunate effect of reducing the Batman/Bruce Wayne to mere supporting player, but it also elevates Gordon even further as a sort of law-abiding reflection of the vigilante crimefighter. And what's wrong with giving the great Gary Oldman more to play? 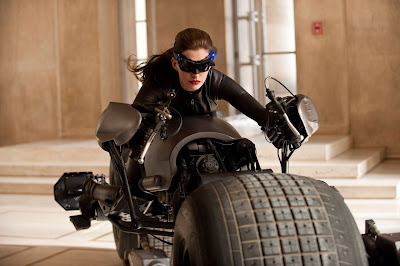 Anne Hathaway's Catwoman, though finely performed, is superfluous enough to qualify as interested onlooker. But Gordon-Levitt is excellent as Blake, the idealistic spawn of Batman and Commissioner Gordon's Faustian pact to inspire Gotham's citizenry to themselves take up arms against crime. (I could have done without the overt reference to Blake's full name being "Robin John Blake.") Michael Caine gets a couple of nice moments before being ushered out of the overstuffed film by a plot contrivance. More problematic are TDKR's villains. Bane has provoked the most mixed reactions. If there's any element of this somewhat more realistic take on the Batman that brings this chapter closer to the outsized fantasy of the Bond films, it is this character. Hardy's face is covered with a mask for most of the film, so all one sees are cold, inexpressive eyes—the stare of a sociopath—coming through. Contrast this with Hardy's sing-song, jovial vocal inflections (still occasionally unintelligible due to digital manipulation), and Bane ends up as one weird cat. While nowhere near as anarchic a presence as Heath Ledger's Joker in the previous film, Bane is still chilling as a sort of emotional cipher. But he really is just a overblown henchman to the vicious, beautiful Talia al Ghul. A lot of TDKR depends on the reveal that she is the prime mover of much of the terrorism afflicting Gotham, the first of a series of surprises in the film's final act. But if you're a comic fan, well-versed in the Batman's history, you could see this reversal coming from midway through the film. And if you're just a casual fan, I'm not sure that the revelation doesn't play like something tacked on since there is little in the way of clues or setup that Cotillard's Miranda Tate is really Talia. Batman's ultimate decision to sacrifice his life by flying the film's time-bomb over Gotham bay is a daring conclusion to the finale, but it is undercut by TDKR's final shot. At first, this shot seems designed to mirror the final shot of Inception, in which Nolan cuts to black before we learn if a top will stop spinning or not, key to interpreting the perspective of the entire movie. Nolan restages a scene Caine's Alfred had discussed with Wayne earlier in the film, a fantasy in which he had hoped to run into a happy Wayne sitting in a piazza in Italy while both were on separate holidays, silently acknowledging each other without causing any fuss. The final shot runs long enough that one thinks Nolan will cut to black after we see a closeup of Caine raising his glass to an unseen person offscreen. But then Nolan cuts to show us it is indeed Wayne sitting with the Catwoman's alter ego, Selina Kyle. It was almost certainly a decision made at the request of Warner Bros., one that robs The Dark Knight Rises of some of its emotional effectiveness. But it is a nice grace note on which to end this iteration of the Batman franchise. The exact problem with Rises is that it's dependent on Batman Begins in a way that The Dark Knight was not and less of a stand-alone film -- all you really needed to see Begins to know before watching Dark Knight was who Rachel Dawes was. Nolan clearly felt that he had to reference Begins to make his trilogy complete, but the absolute irrelevance of the League of Shadows to the second film really proves him wrong. On the other hand, his pious refusal to pick up the major available plot thread from Dark Knight -- left literally dangling in that picture -- undermines much of any claim to cohesiveness. And still I liked Rises, too, and Nolan has Hardy and Hathaway to thank for that. Was waiting for your thoughts...Saw it yesterday and really struggled to enjoy it. As always, you provide some food for thought. However, in a superhero tale, your supervillain has got to be on point. Bane was a massive letdown and his summary execution recalled two other movie moments, both inappropriate for the time and place: Darth Maul and the scimitar wielding villain in Raiders. I absolutely agree with your take on the ending, which the final straw for me. Really bummed. yeah i really liked this. i think in the second viewing i got more of an emotional pull with it, but i always got alfred's emotional punch. that was excellent. 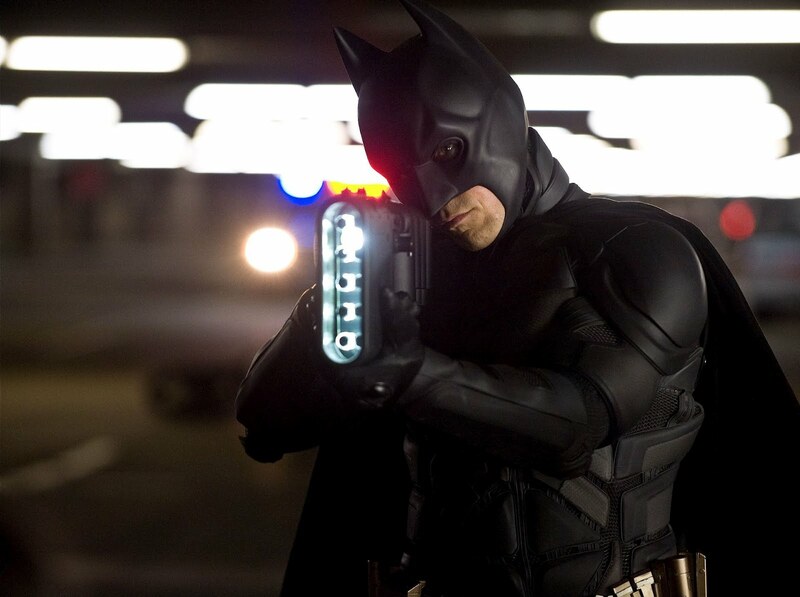 I thoroughly enjoyed this film and found it to be a satisfying conclusion to Nolan's BATMAN films. I like how this film brought everything full circle by tying it into BATMAN BEGINS. I also like how Nolan avoided the common mistake a lot of comic book superhero films makes by loading up the film with too many villains and taking the focus off of the hero. This film was all about Bruce Wayne/Batman and him finally dealing with the fear and guilt that had haunted him his entire life. As other reviews have pointed out, I think that this film features the best performance by Christian Bale in any of the BATMAN films. He really has run to the emotional spectrum here, esp. with that powerful scene where dismisses Alfred. A lot of people have talked about how powerful Michael Caine is in this scene but I felt that Bale matched him and it really affected me seeing how he Wayne tried to keep his emotions in check but his eyes showed how close he was to breaking down. Great stuff. Also loved Tom Hardy's take on Bane. The odd voice he adopted was a bit jarring at first but it was interesting how he juxtaposed it with his impressively imposing physical presence. Once again, Nolan utilized some conventions from the horror genre - one he obviously has an affinity for - with Bane playing the monster that must be stopped. I'd love to see Nolan make an actual horror film. I also thought Nolan got the best performance out of Anne Hathaway to date. I was never a huge fan of hers but she was quite good in this film and held her own with the likes of Bale, Tom Hardy, etc. What I liked most about The dark knight rises where the theme's Nolan was playing with. Batman at war. Batman during daytime. An opponent physically strong enough, smart enough. The supposedly death of Batman. The rebirth of Bruce. Another thing about Bane I liked is ,though an unstoppable force, he turned fragile for Talia. This, to me, makes him even stronger, especially when Talia left and he was himself again and ready to finish Batman off. 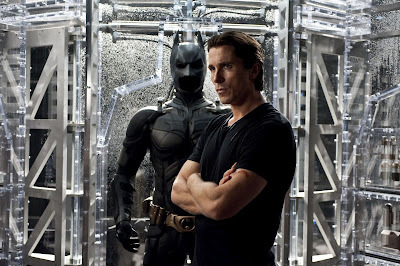 Normally after seeing a film, the hype feeling goes away, but now, after seeing, even more I'm searching anything there is to know about TDKR. This movie got a special grip on me. Excellent and well done Mr. Chris Nolan, thank you. restaurant at the very end? Also, I think it was pretty clear that even though Nolan is done with the series, they did lay the seeds for a sequel, if they decide to hand it off to someone else. We saw the movie last night, and I enjoyed the action scenes. I think you hit the nail on the head when you pegged it as "calculated". However, like Hunger Games, I had to get over my disbelief in the plot premise throughout the movie. It was easier in "rises" than "games". I really liked the Bane character, but more as a modern (Craig) era Bond villian than a Batman one, especially with his "...but perhaps I've said too much" egomaniacal tones (and Leader-of-men Lincoln coat hold). As much as I hate to say it, because I know it is would be superfluous and even pandering, I wish there was more new bat-weapon coolness, too.